This article will show you how to whitelist email addresses on popular email clients, ensuring that you get the emails you want. “Why do my emails always end up in the spam folder?” That’s a question that we always get when we start talking about email marketing to our clients. Now, there might be many reasons why some emails get flagged as spam (suspect subject lines, disreputable IP addresses etc). And while there are ways to guard against them, the only surefire way to ensure that your email gets through is to get your receivers to whitelist your email address. This means that the receiver has explicitly told his email client to accept any emails that come from your email address. Of course, when it comes to email marketing (when you’re sending emails to a group of people instead of just one person) there are additional precautions that you should take. But that’s another story for another day. Here’s a simple solution we’ve prepared for you to help ensure that all your emails bypass those hyperactive spam folders and into your clients’ inbox. Just add a line like this to your email signature and link it to this article (full link – https://cloudrock.asia/whitelist-email-address/). We use Google Apps at CLOUDROCK and we think it’s great, so you’re going to get the full illustrated version for it. In order to whitelist emails in Yahoo! 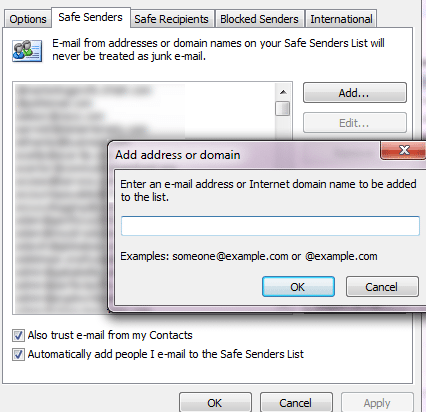 Mail, you’ll need to create a filter to automatically receive emails from selected email addresses. a) Click on the ‘Home’ tab. c) Then ‘Junk Mail Options’. 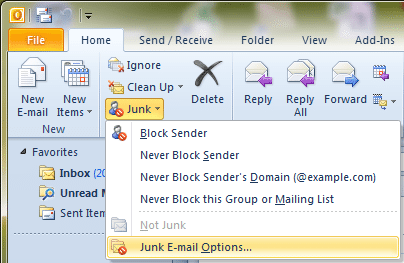 d) In the ‘Junk E-Mail Options’ dialog box that shows up, click the ‘Safe Senders’ tab (second option). Proceed to add all the email addresses (fairuze.shahari@cloudrock.asia) or domains (@cloudrock.asia) you want whitelisted.